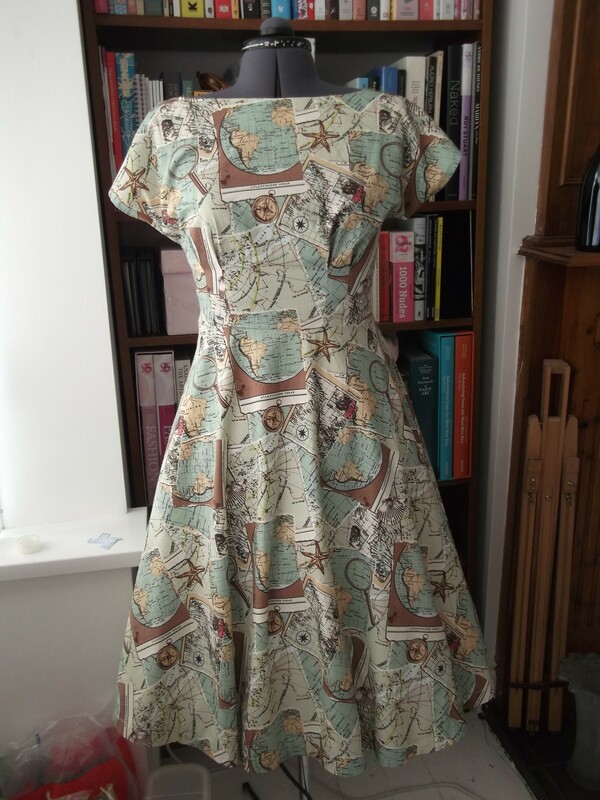 I have another By Hand London Anna dress to show you today! 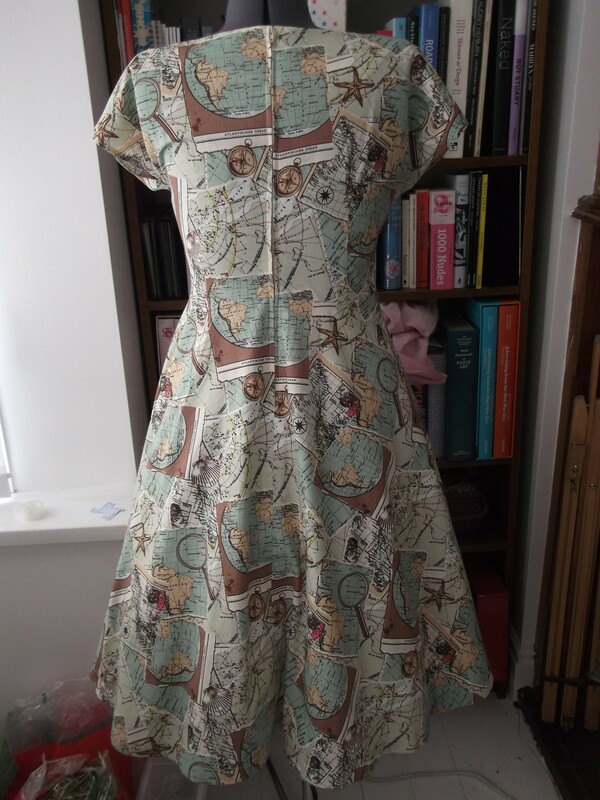 This one has yet another skirt variation – I had a decent length of this map fabric from Goldhawk Road so I decided to draft a circle skirt for this version of the Anna dress, and I made the higher neck version rather than the v-neck this time. 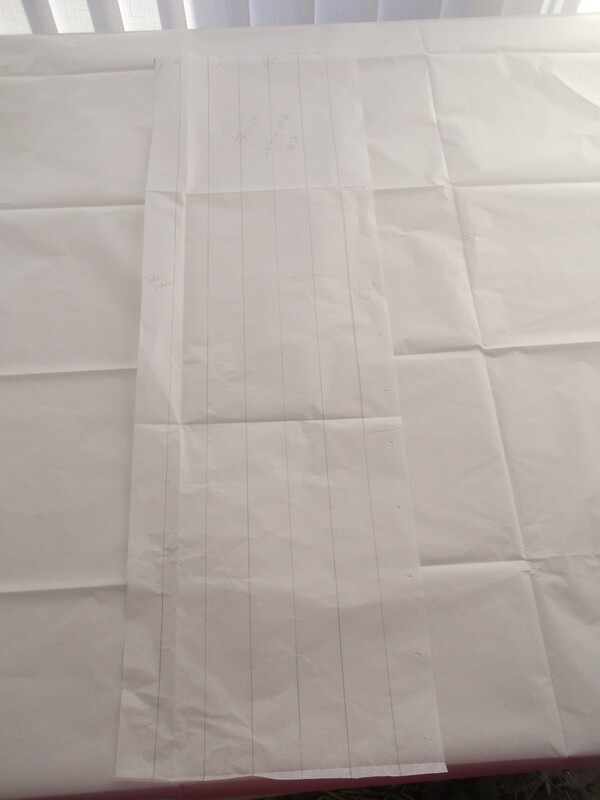 To make the circle skirt, I measured my waist, divided it by four and drew a rectangle measuring ¼ of my waist wide and my desired skirt length (I went for 70cm to give me plenty to play with). Rectangle measuring a quarter of my waist wide and my preferred skirt length long. I then drew straight lines from top to bottom to cut along. 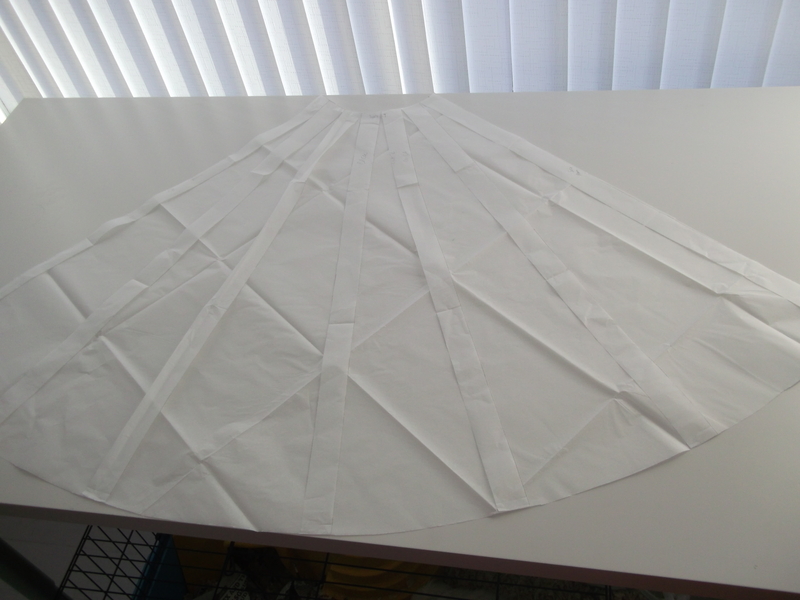 I then used the slash and spread method which I learned on my pattern cutting course to make the circle skirt pattern, and once that was done I added the seam allowance. Circle skirt pattern – slashed and spread and filled in! I spent a lot of time very carefully cutting the fabric to ensure that the pattern on the fabric would match up exactly at the waistline where the bodice meets the skirt. So much so, that I paid very little attention to matching the pattern at the centre back seam, and I ended up with a massive mismatch!! The stupid thing is that this mismatch is far more noticeable than a waistline mismatch would have been…oh well! The dress came together very quickly and easily – no wonder everyone loves this pattern! And I’m totally thrilled with the finished result. Oh, and as this is green fabric, I’m going to include it in the Sewcialist’s Green December collection! This will probably be my last entry for Green December though – I do have plans for another green dress but I’ve got lots of other stuff on the go at the moment! One last note: in order to be able to hem my (half) circle skirt more easily, I used Gillian’s excellent tip: gather the bottom edge with your overlocker, which will make it easier to ease in the excess fabric when turning up the hem! All of the seams inside are overlocked, so it looks very nice and neat. I’m really pleased with how the dress turned out, but I haven’t worn it yet! I need to go to some sort of Geography convention or something!!! This looks amazing, I’m so impressed with the way you’ve pattern-matched the fabric at the waist as well, I am always too lazy for that. 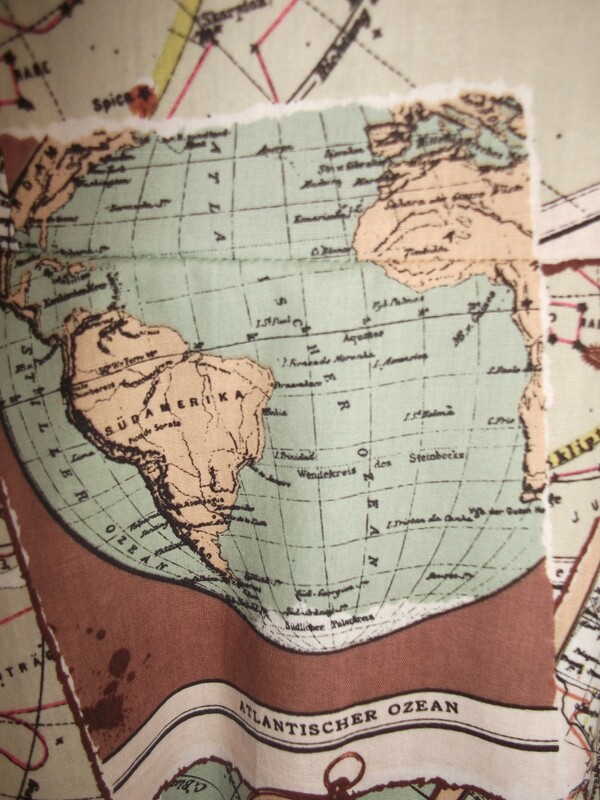 I have been looking for some map print fabric for so long, I love this. Looks like I need to go to Goldhawk Road in the new year! This is so cute! What a fun fabric, and even more so with a sweet, twirly skirt! I’ve just made V8882 (which is a circle skirt with box pleats) and was thinking that I wanted to put it on the Anna bodice and the Elisalex bodice and this has made it even more urgent! I know what you mean, I’d love to go back & see you all again, and snap up even more wonderful fabric! Goodness me – a circle skirt with box pleats – that must take up a lot of fabric! But it sounds really great. Looking forward to seeing it. I’m sure it would look great on any bodice! 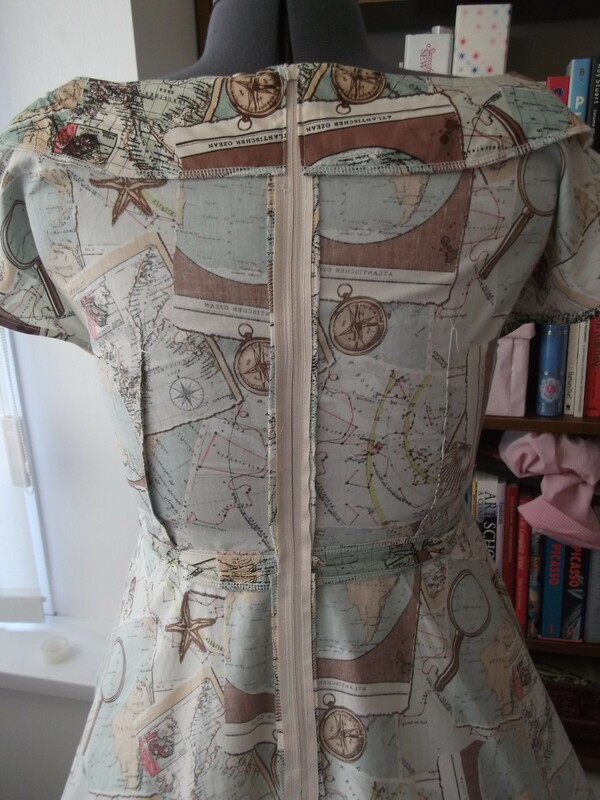 I love the map fabric! I need to start getting these kind of fabrics that I love. I don’t know why I don’t just buy them! I love it too! It takes me AGES to actually commit to buying fabric – this one I saw it and left it and went back for it later! I worry that impulse purchases might not turn out so great, and I hate wasting money! Love it! It really suits a circle skirt! 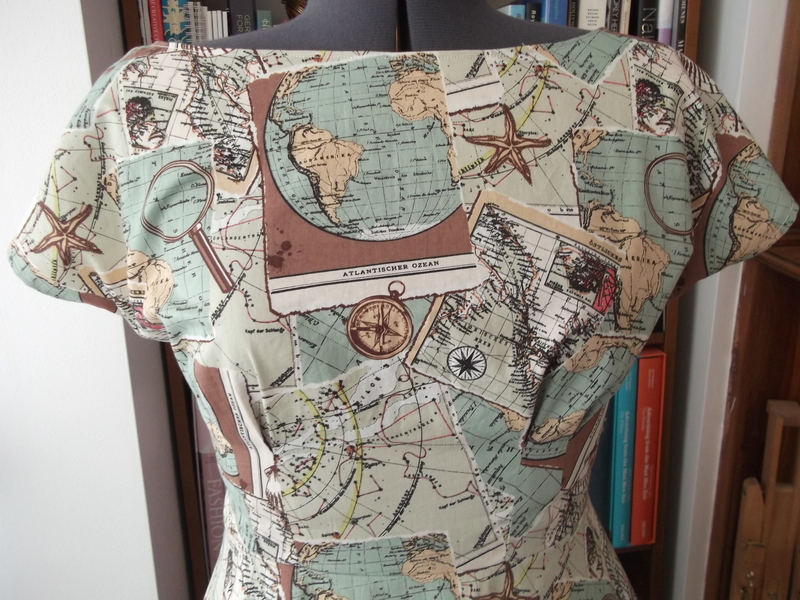 I love map fabric… The Anna/ circle skirt is a perfect way to showcase it! Pretty dress! Thanks Laurie! I bought the fabric with a dress in mind, then for a few months I thought it would look weird as a dress and it became destined for pyjamas. I finally reverted to plan A and I’m really glad I did! I love this dress! Oh, that fabric! It’s gorgeous, and the Anna bodice really shows it off without any annoying bust darts to break up the print. It is a great pattern for showing off a good print! I just love this fabric! Great choice to use it on the Anna dress with the circle skirt. Looks just lovely! Anything map relayed just works. I have a number of maps from cities / countries I’ve been to and can’t bring myself to throw them away. Sounds like you need to get some map fabric for yourself then! Yes, I’ll have to find some. I made a skirt out of glow in the dark map of the night sky fabric for a david Bowie sewalong. 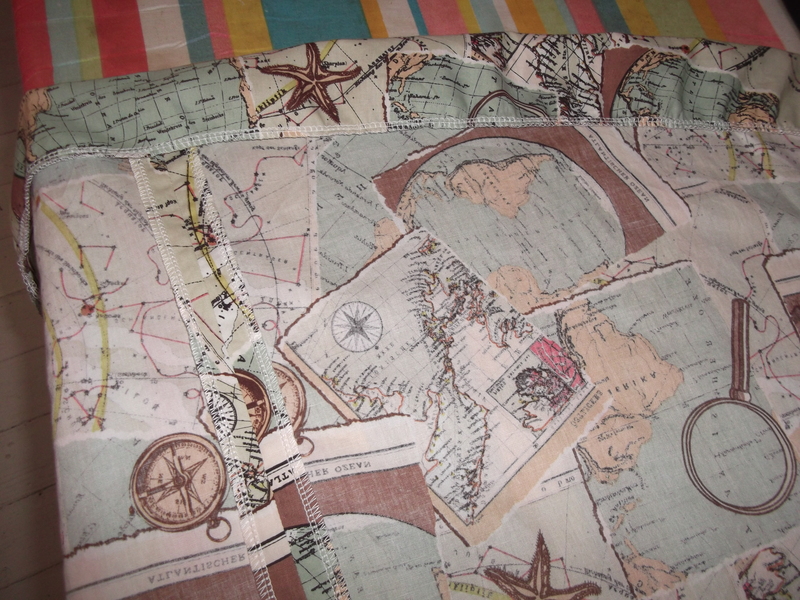 Now need land map fabric! Wow! That sounds amazing! Did you blog it? It is super simple. Just don’t forget to add seam allowance!